Rishikesh in Uttarakhand, India, is popular for the Ashrams and Bathing Ghats on the banks of Ganga River. There are also several temples in Rishikesh and the most famous one is the Bharat Mandir – this is the oldest temple in Rishikesh and is named after Bharat – the brother of Sri Ram. Rishikesh is called the yoga capital of the world. Rishikesh, the 'place of the sages' is an important holy town in Hinduism and it is locted on the banks of the holy Ganga River. 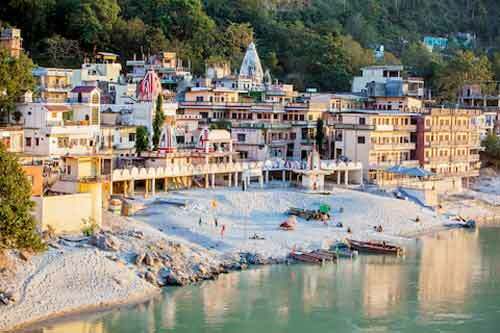 It is believed that when Raibhya Rishi undertook rigorous penance, God appeared in the form of “Hrishikesh” and henceforth this area came to be known as Rishikesh. It is the starting point for the Hindu Char Dham pilgrimage, which includes Yamunotri, Gangotri, Kedarnath and Badrinath. 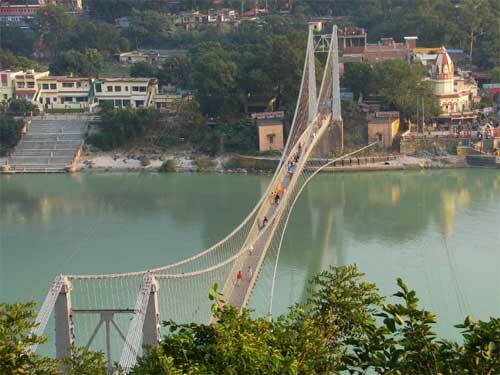 The most important landmarks in Rishikesh are the iron suspension bridges over Ganga River. A famous landmark in Rishikesh, Lakshman Jhula is an iron suspension bridge over the holy Ganges. This 450 feet long bridge connects Pauri district with Tehri district. As per legends, Lakshman, younger brother of Sri Ram, crossed river Ganges on a jute rope, the place is where the bridge is located today. Popular temples around Lakshman Jhula are Trayambakeshwar Temple, Sachha Akhileshwar Mahadev Temple, Lakshman Temple, and Shri Raghunath ji’s Temple. Ram Jhula is another popular 450 feet bridge and the popular attractions near Ram Jhula are Sivananda Ashram, Swargashram, Beatles Ashram, Yog Niketan, Parmarth Niketan, Geeta Bhawan, and many more holy places. Rameshwar Temple, Lakshmi Narayan Temple, Gita Bhavan, and an Ashram near Gita Bhavan with a Navagraha Temple are located on the other side of Sivananda Jhula (bridge). 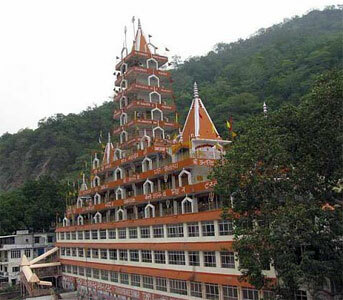 Bharat Temple at Rishikesh is dedicated to Hindu God Vishnu and is named after Bharat, the younger brother of Sri Ram. This is one of the oldest temples in Rishikesh and is located at the Triveni Ghat on the banks of Ganga River. Adi Shankaracharya is believed to have installed the murti here. Legend has it that Vishnu gave darshan to Sage Raibhya here. It is also believed that Bharat and Shatrughan meditated on the spot. The temple was visited by Pandavas who were on their final journey to the Himalayas. Although the temple is dedicated to Vishnu, there are murtis of Shiva. 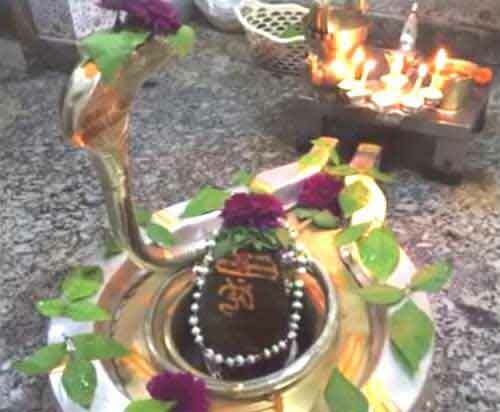 The main murti of Vishnu worshipped in the temple is carved out from a single Shaligram. Another highlight in the temple is a Shri Yantra believed to have been installed by Adi Shankaracharya. There are also shrines of Ganesha and Bal Krishna here. The most important days at the temple are Basant Panchami and Akshaya Tritiya. On Basant Panchami, the main murti (Shaligram) is taken out in procession to the Mayakund for holy bath. It is considered highly meritorious to go around the temple on Akshaya Tritiya day. Another highlight at the temple is an old tree - not a single tree but three trees growing together. Banyan Tree, Pipal Tree and Bel Tree. These three trees symbolically represent Brahma, Vishnu and Mahesh. A museum in the temple compound houses murtis and other artifacts excavated from the temple site. This include murtis of Yaksha and Vishnu. Trimbakeshwar Temple, also known as Tera Manzil Temple, is a unique temple located in Rishikesh. 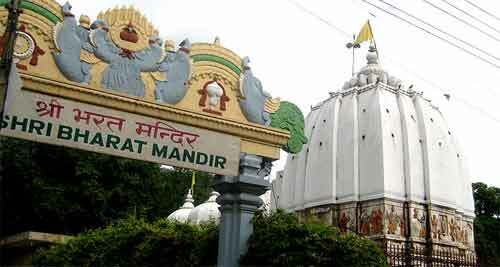 It is a 13-story tall temple with murtis of various gods and goddesses from Hindu pantheon. It is located near the Lakshman Jhula (Bridge). The popular belief is that prayers offered at this temple are fulfilled. Thousands of devotees visit the shrine. The structure is also an important landmark in Rishikesh. Devotees can have a beautiful view of Rishikesh from the temple. The popular Neelkanth Mahadev Temple, dedicated to Shiva, is atop a hill and is a 12 km trek from Lakshman Jhula. The temple is associated with Shiva’s holy act of drinking the Halahala poison during the Samudra Manthan or churning of ocean. The temple is located near the Swargashram. Legend has it that after drinking the Halahala poison, Shiva rested under a peepal tree. He mediated here for several years and annihilated the effects of the poison. It is believed that Goddess Parvati and other deities in Hindu pantheon had darshan of Shiva here. The peepal tree or Vat vriksh under which Shiva meditated can be still seen here. Neelkanth Mahadev Temple has a gopuram similar to one found in South India temples. The gopuram depicts the Samudra Manthan episode. The temple is a four hour trek from Rishikesh. For quicker approach there are taxis and jeeps. The main murti worshipped here is the Shivling. In the Shravan month thousands of Kanwaris reach the temple to pour water over the Shivling. Kailash Niketan, near Lakshman Jhula, is a big structure with numerous murtis of Hindu gods and goddesses. This place is around 3 km from town center. Tirumala Tirupati Devasthanams have two temples here – Venkateswara Temple (Balaji) and Chandra Chandramouleshwara Temple. They are located on the Muni Ki Reti Road. 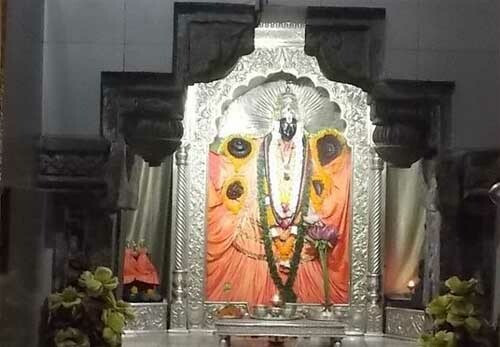 The other important temples in the locality are the Shatrughna Temple, Pushkar Temple, Bhuvaneshwari Temple, Chitragupta Temple, Someshwara Temple, Kali Temple, Bhairav Temple, Veerabhadra Temple and Pataleshwar Temple. All these are small shrines. The Sivananda Ashram at Rishikesh has a temple dedicated to Shiva – Vishwanath Mandir and is one of the popular temples at Rishikesh. Lakshman Temple is another popular shrine located 3 km away from the town center – near Lakshman Jhula. 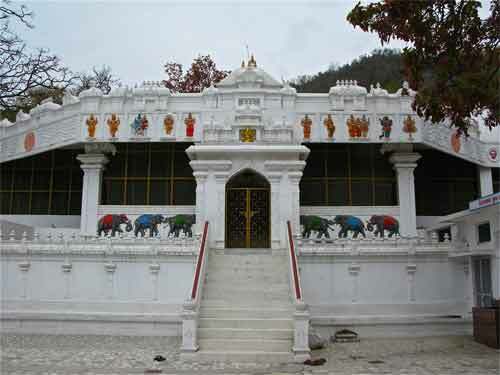 The ashrams located at Rishikesh also have temples and these are popular with devotees. The Sivananda Ashram is the headquarters of the Divine Life Society. They also conduct retreat and yoga courses details of which are published in the official website. Parmarth Niketan is the largest ashram in Rishikesh. The ashram provides shelter to thousands of pilgrims as it has 1000 rooms. Parmarth Niketan is located in Swargashram, on the main road, just on the banks of the sacred Ganges River. The ashram offers a way of life based on the teachings of Bhagavan Sri Krishna. The Ashram is small you need to enquire before deciding to stay in the ashram.